Read this diagram in conjunction with the associated scenery plot and staging analysis. From SHARP News 24.2 (2015), 23-4. Philip Major (ed.). 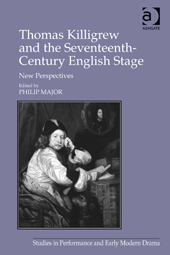 Thomas Killigrew and the Seventeenth-Century English Stage: New Perspectives. Farnham, UK & Burlington, VT: Ashgate, 2013. xii, 228 p. ill. ISBN 9781409466680. £60 (hardback). This collection is better appreciated as offering new perspectives on Killigrew’s life and various occupations, rather than a reappraisal of his work in relation to theatrical production, as the title suggests. As such, it succeeds in its aim of fleshing out our understanding of a significant but elusive individual who tends to be characterised in negative one-dimensional terms, variously as a venal minor courtier, an incompetent theatre manager, a writer of prolix closet plays, or a licensed buffoon. The eight chapters in this book demonstrate the shallowness of these judgements and add not only to our knowledge of the man but also to our understanding of the complex web of commerce, politics, patronage and social networking that constituted the workings of the Stuart courts in which he was immersed. The book approaches its subject from several different angles: theatre and theatre production, drama and genre, patronage, and Killigrew as exile and courtier. For the most part these approaches intersect engagingly, though there is inevitably some repetition, and the collection succeeds in its aim of generating a welcome feeling of unpredictability as one moves from chapter to chapter. Some may view this as a lack of focus, but this would be to discount the detailed and persuasive arguments permeating this collection that work collectively to shed new light on its shadowy (and inherently ill-focused) subject. The first chapter, by Eleanor Collins, which examines pre-Restoration production of two of Killigrew’s plays, exemplifies these attributes and offers fresh insights from the perspective of Repertoire Studies. Similar attention to detail is evidenced in David Roberts’s chapter, which sets out a refreshing counterargument to the traditional view of Killigrew as a bad theatre manager. In a highly engaging and eloquent chapter on autobiographical aspects of the two-part play Thomaso, Jean-Piere Vander Motten conveys a felt sense of the experience of exile for Royalists like Killigrew during the 1640s and ’50s. Vander Motten’s essay makes us see Thomaso in a new light as a subtle, rich work in its own right, rather than as merely the source play for Behn’s more renowned adaptation. Marcus Nevitt similarly focuses on Thomaso, inviting us to view the play as two separate, theatrically viable five-act plays rather than as a single ten-act closet play. Nevitt provides an excellent account of Thomaso’s structure and of Killigrew’s subsequent editing of the play, which points, he argues, to a likely post-Restoration production. In this case the overall discussion of the play, with its helpful comparison to Davenant’s The Siege of Rhodes and its fascinating pointing up of the play’s meta-theatricality, proves more intriguing than the argument, but both these chapters achieve the laudable goal of making readers wish to (re)take up the plays for themselves. Despite a significant number of typographical and similar errors that mar the reading experience at several points (an inadvertent exchange of captions to Figs. 4.1 and 4.2 being the most disconcerting), all the chapters offer new insights into Killigrew’s work and milieu. In reading this fascinating and diverse collection one is forced to reconsider received opinion of Killigrew’s work and character. The man re-emerges not necessarily as a more likeable or significant figure, but as one more human, more rounded, more explicable actually as an adept survivor. In short, this book suggests possible answers to the question it asks in its introduction about who might be the “real” Thomas Killigrew. The play was printed in 1673, two years into the Duke’s Company’s occupation of Dorset Garden, but the prologue printed with the play tells us it was “Spoken at the Theatre in Lincolns-Inn-Fields”, and that the play was “first writ, a dozen years agoe”. Using evidence from the prologue the London Stage assigns this play to September 1671. However, this date does not sit happily with the stage directions, which imply at the least a larger discovery area than suggested by any other LIF play. Act 3.3, for example, is headed “A Dining-Room, in which is discover’d sitting at Supper/ Tyridates, Pheroras, Alexas, Attendants”. Unless there are missing curtain directions this must be a shutter discovery. Three people sitting at a table being served is possible, but in the course of the scene three other characters enter, and near the end we find the direction, “Enter on the other side with drawn Swords, Alexas and Souldiers”. The scene is not long (57 lines), but it is unusual for shutter discovery scenes in LIF plays to include so much dialogue and action, and there is no obvious opportunity for the actors to move downstage. The implied stage width when the soldiers enter is greater than the maximum of eight feet available in the LIF model but may well have been possible at Dorset Garden. In their re-examination of the evidence, Milhous and Hume reassign this play to circa August 1673, a date followed by Pierre Danchin. This date gives a time lapse of around six months between production and publication, which Milhous and Hume establish was standard at the time. 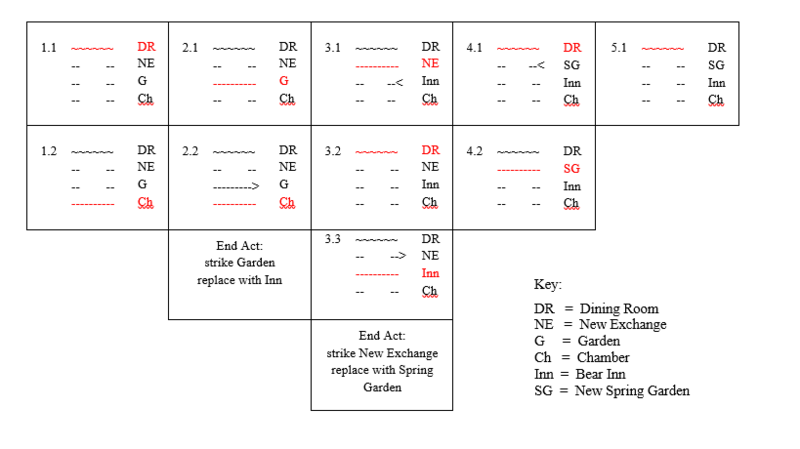 The reassigning to Dorset Garden concurs with my analysis of the stage directions, as outlined above. The stage directions and headings in this play are, nevertheless, highly interesting. If the prologue is correct in stating that the play was already old when it was first performed – and there is no reason to doubt this – the stage directions and headings were almost certainly added later. The mix of fictionally assigned locations (e.g. “Herod’s Pallace”) and generic theatrical ones (“a Castle”) together with the implied technical demands of some stage directions suggest theatrical, possibly promptbook, annotation. For the reasons outlined above, this play is not included in the overall scenic analysis of LIF plays. London: William Cademan, 1673, preliminary matter. 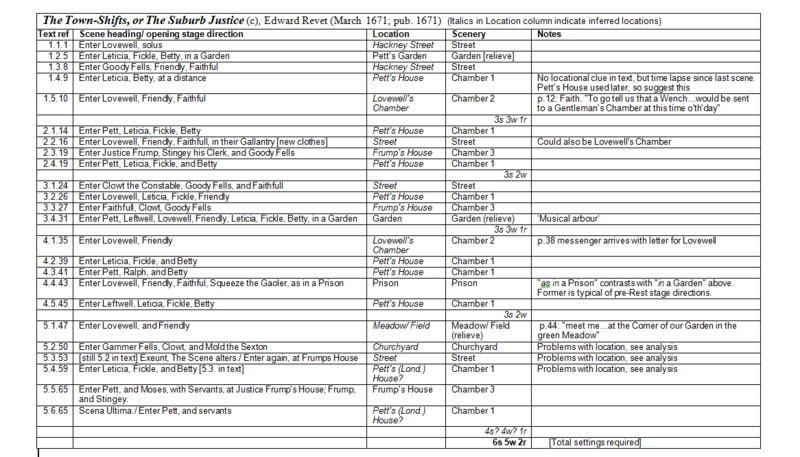 See Judith Milhous and Robert D. Hume, ‘Dating Play Premières from Publication Data, 1669-1700′, Harvard Library Bulletin, no.22, 1974, p.386. According to the Literature Online database only 15 plays first performed in the period 1660-1700 begin with a song, and this is the first. Three authors – Behn, Crown and Nathaniel Lee – had a particular liking for the device. Crown uses it in two other plays, but Lee takes the palm with four. While Juliana has been criticised from Langbaine onward for the absurdities of its plot, it is highly interesting from a staging point of view. The play is scenically varied with only two of its 20 scenes not provided with a scene heading, and the stage directions suggest that the LIF production made extensive use of the full stage area. Altogether, 12 fictional locations are specified with a further two implied. In production these would likely have been reduced, and in the scenery plot I have used a total of 11 settings: nine shutter pairs, one standard relieve setting, and a combined shutter/relieve setting for the ‘hollow rock’ called for in Act 4. It is also likely that Crown intended shutters for one setting to be used with wings from another in two of his scenes (2.5 and 5.2). In terms of accommodating these settings in the LIF model, only Act 2 demands a mid-act scene replacement. At the start of Act 2 the model would be preloaded with palace, street, and hall shutters, with grove relieve rows sitting behind. At the end of 2.2 the street shutters and wings would be replaced by grove wings and shutters showing a palace exterior. These two elements are combined in 2.5. This seems the most economical way of satisfying Crown’s scene heading, which states: “The Scene a Garden, at the one end a Palace”. This solution only requires a shutter pair representing a view of the palace to close over the relieve space; the garden/grove wings from the earlier scene remain in place. A similar solution would serve 4.3-4.4 where the garden tree wings would be backed by a composite shutter and relieve setting of a ‘hollow rock’ or cave, and would also satisfy Crown’s curiously worded scene heading to 5.2. The heading reads, “The Scene a Palace to the Street”, but the words ‘palace’ and ‘street’ have possibly been printed in the wrong order. The ensuing scene takes place wholly outside a locked palace gate, so, assuming that what is required here is a street leading to such a gate, I have used the town wings last seen in 3.2 together with a new shutter pair representing a large gate or door fronting a palace exterior. The scene does not require the gate to be practical and it may be played centre stage with the offstage porter standing either directly behind it unseen, or behind one of the final wings. The scene immediately before this poses a different problem. Crown’s heading for 5.1 states, “The Scene a Hall”, yet fictionally the opening speech is clearly delivered from a location outside the landlord’s hall. There can be no doubt that the landlord’s hall, used previously in 2.3, is the required setting here, so how can this spatial anomaly be explained? The short answer is that it is brief, serves a dramatic purpose, and does not affect our understanding of the rest of the scene. The speech in question is just three lines long and is used simply to link the narrative at the end of Act 4 to that directly following in Act 5. In a modern play there might well be no gap in the action, but on the LIF stage several minutes of Act music would have split the narrative at this point. At the start of Act 5 the scenery for the landlord’s hall replaces that of the ‘hollow rock’ and Battista hurriedly arrives. She tells the audience “this is our Lodging”, and that from a close vantage point she can “see the persons coming out of the house”, she then exits to keep watch. The anomaly involved is an effective theatrical cheat that immediately sets up the ensuing scene. It is anomalous, but it is a controlled anomaly of a few seconds duration, a world apart from that proposed by other commentators on Restoration staging. We know that Juliana’s party is escaping through the Landlord’s gardens because Crown had previously given a long-winded speech to the Landlord fully describing the local topography. In 5.3 the masque sequence would be difficult to stage without using the whole stage. The relieve area is used for two scenes, the Landlord’s garden and the previously mentioned ‘hollow rock’. This is evidently a cave or grotto with a separate shutter pair and is used to display the Cardinal’s body not once but twice, in scenes 4.3 and 4.4. This double discovery of the same sight is surely one of the theatrical ‘slips’ to which Crown refers (quoted by Langbaine), “there are few Authors but have had those slips from their Prune, which their riper thoughts…had reason to be asham’d of”. London: William Cademan & William Birch, 1671, p.21. Gerard Langbaine, An Account of the English Dramatic Poets, Oxford: 1691, p.96 [Scolar Press reprint, 1971]. Genest’s evaluation of Revet’s nostalgic (or simply old-fashioned) comedy is about right: “it has no particular fault, but the plot is slight, and the dialogue insipid”. Summers calls it an Elizabethan “throw-back”, but notes its “realistic scenes of middle-class life and manners”. In terms of staging, the play is uncomplicated apart from some scenic confusion in Act 5. Indeed, in terms of the LIF model, ‘regular’ would be an apt description with no prior act implying more than three shutter settings and one relieve. Lovewell’s gestic “there” seems to preclude the interior setting suggested above; indeed, as it stands, the speech only makes sense if Lovewell’s party are outside Mold’s house. Now there is nothing in the preceding dialogue of 5.2 that demands an interior setting, in which case the setting might well be an exterior. This solution satisfies the dialogue, but it requires a certain interpretation of fictional events. We know the early hour and we also know that Mold had been up drinking the previous night. If this is an exterior setting – presumably a graveyard – we must, therefore, accept that Mold is up and about his work and has been intercepted at this early hour by Fells and Clowt as the scene starts. This interpretation of the fictional action does not necessarily present any difficulties, especially for a period audience used to early rising, but it is not exactly fluent theatrically. The comedy in this scene is partly visual. Mold is a put-upon character who is never allowed to have his say. He is silent during the whole scene, yet he is repeatedly asked direct questions. One imagines the fun of the scene might arise from seeing poor old Mold repeatedly cut off by the two chatterboxes, Fells and Clowt, just as he is about to speak. This gag would be underlined if Mold was a pathetic figure hovering around in his nightshirt. This may seem a highly subjective interpretation, but were it not for Lovewell’s “there” it would be an obvious theatrical solution. Indeed the reader, lacking visual clues, will assume that the scene is set in Mold’s house until the point at which Lovewell enters. If then we omitted one letter and amended Lovewell’s ‘there’ to ‘here’, the scene would play perfectly well as set in Mold’s house. For the scene plot, however, I have decided on the line of least intervention and have allocated an exterior setting. Whatever we decide, we can be in no doubt that Revet fully intended the use of scene changes in this act. Any appeal to Visser’s model of an unchanging setting with interior scenes being played against an exterior backing is immediately quashed when at the end of this scene we read, “Exeunt, The Scene alters./ Enter again, at Frump’s House”. Here as with other LIF plays there can be no doubt that this play was written with the variety of scene changes in mind. I greatly suspect that the implied scenic demands in Act 5 of this minor play would have been simplified in production. As it stands, the scenery indicated in the plot would demand two mid-act replacements of shutter settings not otherwise seen in the play, even allowing for one relieve setting (in this case the field). I suspect that the LIF scene keeper would not have differentiated between the setting for Pett’s Hackney house seen elsewhere in the play and his London house fictionally demanded here. Playhouse Of Pepys, op cit pp.387-8. “we shall be there [Mold’s house] by five a Clock” (The Town-Shifts, op cit p.50). As with The Women’s Conquest, Howard provides little information about scenery or settings in this play. There are three vague scene headings (to 4.1, 4.2, & 5.1). The first two specify a staging feature – two pillars in one, a bed in the other – and the last is cryptic: “The Scene resembles a Tribunal of Love”. From the dialogue it is clear that the pillars appear in a street. The 4.1 heading reads, “The Scene opens with two Pillars with decrees on them on both sides the Stage”, and in reference to the pillars one character says, “’Tis a Decree fix’d here, and in most Streets”. A street would also best fit the preceding scene, 3.1. This is a busy scene in which most of the cast make an appearance. The freedom with which characters exit and enter and the lack of any dialogic clues to the contrary suggest an exterior setting. A street, which stays onstage for 4.1, is the logical choice. Most likely, the pillars, which are not practical, would have been represented by a special pair of wings in the first position (nearest the audience). These could be loaded into the wing frames during the musical interval at the end of Act 3. The heading for the next scene specifies a relieve setting: “The Scene opens and discovers a Bed”. Although not stated, it would make sense if the street wings (and pillars) were replaced at this point by those representing a chamber. The wings for Meredith’s lodgings used in Act 1 would suffice, though a separate setting would be perfectly possible. The bed is obviously set in the relieve area. This is a bed-trick scene. Sir Solymour has been led to believe he is to enjoy a liaison with the fashionable gentlewoman, Celinda. Instead, the bed’s occupant is, “A Blackamoor Boy disguiz’d like a Woman”. From the text it is clear that Sir Solymour and the boy act in the relieve area while various other characters gather on the forestage to surprise and humiliate him. The last heading is particularly vague. There are no clues as to how “A Tribunal of Love” might have been represented, but an interior setting is likely. Howard’s lack of interest in scenery might suggest the same interior used for Meridith’s lodgings; however, I think the same diffidence might also suggest that when a heading is provided it is significant. I believe this heading calls for a different setting and one more public than previous scenes set in private houses. The scenery plot, therefore, specifies a stateroom of the kind seen in previous LIF plays. Thus, the play can be served by three shutter scenes – lodgings, street, stateroom – a relieve to represent Celinda’s lodgings, and wing settings to match the three shutters (with additional pillars). Alternatively, a separate set of wings could be used for Celinda’s lodgings, requiring the wings for Meredith’s to be replaced at the end of Act 2 or 3. Up to nine chairs are needed in Act 1 for a council meeting. As Howard directs stools to be brought on in Act 2, the chairs are also likely to have been brought on by servants from the wings and set either in the scenic area or on the forestage. There are subsequent forestage entrances, so the scenic area is probably the best position for the chairs. The stool scene in Act 2 – a women’s meeting – is a parody of the Act 1 council meeting. Howard’s direction reads, “Enter a man with Stools and Table”. Six women are to be seated, the fact that one man is directed to bring on all the furniture – note stools, not chairs as for the men– suggests a comic effect may have been intended. London: Thomas Dring, 1671, p. 68. That Act 1 is set in Meredith’s house is clear when a page boy reports to Meredith, “Some of the Chief Magistrates of Utopia, Desire admittance” (p.9). There are no such clues for Act 2, but an interior is indicated and there is no compelling reason why the Act 1 setting should be replaced. Ibid. front matter (Dramatis Personae).